Not in the best of taste, of course, but it does make an important point in recognizing that an awful lot of voting Americans really do like Donald Trump’s combativeness. 8 Feedbacks on "Trump Not Invited to John McCain’s Funeral"
McCain seems to go out of his way to be a dickhead. He has always been a faux-conservative. He has a very exaggerated and high opinion of himself and his moral superiority. He uses his service record, specifically is POW status in much the same way blacks use their color to excuse himself from any responsibility and to gain advantage in all things. If his plane hadn’t been shot down we would have never heard of him or from him and the world would be a better place. Insightful observation, GWTW, although I would point out that what McCain did ought to give him considerably more points than “being black”. FWIW, I will not be attending either. Songbird is on his own. John McC. just needs to shut up and play some solitaire to pass the rest of his time. 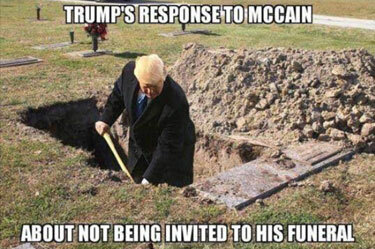 If I were Trump, I’d issue an order that McCain not be buried in Arlington. Is it a crime to piss on a dead senator’s grave? Asking for a friend. And don’t forget the way he screamed at the wife of a missing soldier in Viet Nam, during a committee hearing on POW’s in 1992. She wanted a more thorough search and believed some men were still being held in the North. Maybe her husband. Kerry and McCain fought like hell to keep the fact that there were men left behind secret. Worst Republican Presidential nominee in modern times. He has been a bitter man ever since that loss and not a real conservative. Most of my co-workers, family, and friends have wanted someone like Trump to run for 20 years. He is going out the hard-way, but I will not miss him.